Meet Darel Carey. We are that excited to that Darel is making his Brea Gallery debut in Immersion. He was gracious enough to answer a few questions about his tape process and his incredible patience to create it! [Darel Carey]: I will be creating a tape installation for the show. [Darel Carey]: When I transitioned from a much smaller medium of ink pen or a small brush to using tape, I think scaling up a bit became a natural path. I also found that when scaled to this immersive extent, my line work came to life in a new way, which was worth exploring more. [Darel Carey]: I've always been a fan of MC Escher's work, and now that I am creating art full time, instead of admiring his work as a fan, I am inspired by his work and story to keep creating to have a satisfactory body of work, or at least get closer and closer to it. I also get motivated to keep creating by people like Elon Musk. A stellar work ethic isn't my strong suit, but seeing Musk innovate and pave a way for our future while working 80+ hours a week reminds me that I should do more and do better. [Darel Carey]: First off, I certainly want people to get lost in my art and enjoy. In addition, I want to inspire people to think about visual & spatial perception and about looking at things from multiple perspectives. The way people view art is a stripped down, simplified version of the way people view the world. My art is very simple, yet complex: lines juxtaposed with lines, yet there are emergent properties that come into play; what one sees and experiences as a whole is more than just the components, which is analogous to the way nature works. [Darel Carey]: Right now in early 2019 in the LA area, aside from the Brea Gallery, I have public installations up at the Torrance Art Museum, The Container Yard, and The Selfie Museum. [Darel Carey]: I don't really have best or worst friends or enemies on Instagram. I really enjoy the work of @RefikAnadol, @CarlKrull, @OfAtomsAndLines, @Peeta_ead, and @1010zzz. [Darel Carey]: My next project will be in a hallway somewhere in London, more will be revealed about that soon. Darel Carey is a visual artist based in Los Angeles. He was born in Curaçao, and grew up in Colton, California. He served in the US Air Force as a language analyst for 11 years, then separated in 2012 to pursue a career in art, graduating from Otis College of Art and Design with a Bachelor of Fine Arts degree in 2016. His current work includes dimensional line drawings and immersive tape installations. Optical and spatial perception are his main focus; he uses lines to shape and bend the perceived dimensions of a surface or a space. Darel has always had an affinity towards spatial perspectives and illusion, and is fascinated by our visual understanding of the world around us. 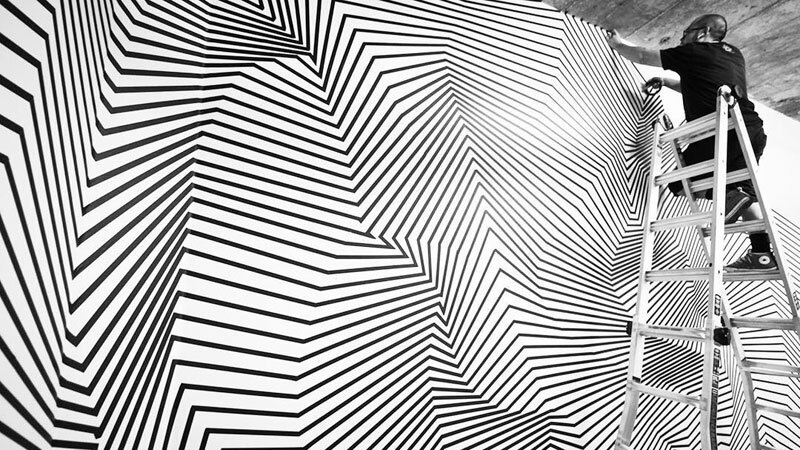 He is influenced by MC Escher's geometrical illusions and tessellations, Carl Krull's line drawings, and Bridget Riley's optical paintings. Forming his line combinations organically, he appreciates the beauty of patterns and emergent properties found in nature, and attempts to embody these attributes in his art. See more of Darel’s work here. Thanks so much to Darel Carey for taking time to answer these questions and letting us get to know him better! Be sure to check out Darel’s latest work on display in Brea Gallery’s group installation show Immersion, opening February 9, 2019.